As we know, 3D movies have joined people’s daily life for a couple of years. The number of 3D consumers is increasing constantly, and 3D videos are becoming the most sought-after things. Instead of going to the cinema, many people prefer to enjoy their 2D or 3D blu-ray movies on VR Headsets or 3D TV to spend their weekends. Supposed that you have a 3D VR heasdets like Gear VR, Oculus Rift, VR One, Google Cardboard, etc or a 3D TV and lots of 2D or 3D Blu-ray movies, how to make them playable with your 3D VR heasdet or 3D TV. We know that nearly all VR Headsets and 3D TVs support 3D SBS MP4 format. So when you convert 2D/3D Blu-ray to 3D SBS MP4 files, you can play 3D Blu-ray on Gear VR, Oculus Rift CV1, Google Daydream VR, Google Cardboard, Homido VR, ANT VR Kit, View-master VR, etc or 3D TV. With a 2D/3D Blu-ray Ripper, it is an easy job to extract 3D SBS content in MP4 format from 2D/3D Blu-ray. AVCWare Blu-ray Ripper (For Mac: Blu-ray Ripper for Mac) must be recommended strongly here as the exellent Blu-ray 3D Converter, 2D Blu-ray Ripper. This Windows or Mac 2D/3D Blu-ray ripping software can decrypt Blu-ray AACS, BD+, UOP, Region codes, MKB V61, MKB V62, etc then export popular video files in any 2D/3D formats. It also can extract FLAC, WMA, MKA, etc audio and subtitles from Blu-ray and DVD movies. You can adjust 3D depth, video resolution, video bit rate, video frame rate, audio bit rate, audio codec to get perfect 3D video. – Transfer Blu-ray 2D/3D disc to 3D SBS MP4 for LG 3D TV, Samsung 3D TV, Sony 3D TV, etc. – Fully compatible with Windows 10, Windows 8.1, Windows 8, Windows 7, Windows Vista/XP, etc. – Mac verson compatible with macOS Sierra 10.11, Mac EI Capitan, Yosemite, etc on iMac, Mac Mini, MacBook Pro, MacBook Air, Mac Pro, etc. How to Watch 2D/3D Blu-ray Movies on VR Headsets or 3D TVs? Step 1: Load 2D or 3D Blu-ray disc. 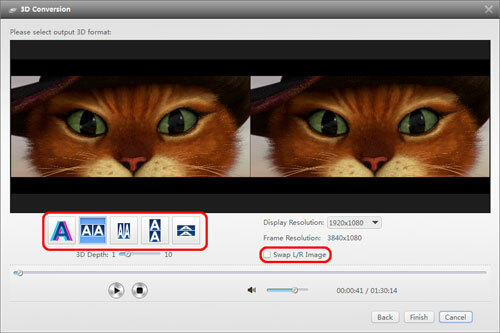 Add 2D/3D Blu-ray from disc drive into this 3D Blu-ray Ripping Software by clicking “Load Disc” button. Or you can choose to import Blu-ray ISO image or Blu-ray folder from hard drive. Tips: The program will automatically select the main Blur-ray title for you, you can select your desired subtitle languages or audio tracks from the drop-down list of “Subtitle” and “Audio” under the Blu-ray title displaying list. Step 3: Select MP4 format for output. Move to “Format” menu, find “Common Video” category and choose “MP4 Video(*.mp4)” as output format for your VR Headsets or 3D TVs. Step 4: Adjust 3D profile settings. 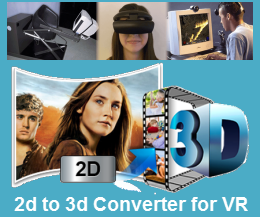 Click “3D Conversion” button on the toolbar to enter 3D Conversion window, you can choose 2D to 3D or 3D to 3D according your source blu ray movies, select the specific 3D resolution: Side by Side (Half – Width) or Side by Side (Full) or change the image display order for 3D SBS movie. Step 4: Start the 2D/3D Blu ray to 3D SBS MP4 conversion process. Go back to the program main interface, hit on the “Convert” button and start to create 3D SBS MP4 video from 2D or 3D Blu-ray disc. When the conversion is done, you can locate the generated 3D SBS MP4 video in output folder to view on VR Headsets or 3D TVs with seriously immersive 3D effect.